NTFS offers file based compression but the compression rate isn't displayed anywhere. 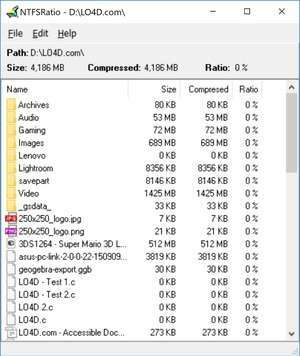 For any folder on an NTFS volume, NTFSRatio shows the size and the compression rate of this folder and also of its subfolders. Compression and decompression can be done inside NTFSRatio with immediate review of the result. Results can be printed or exported. For security reasons, you should also check out the NTFSRatio download at LO4D.com which includes virus and malware tests. Additional screenshots of this application download may be available, too. NTFSRatio download been highly rated by our users.